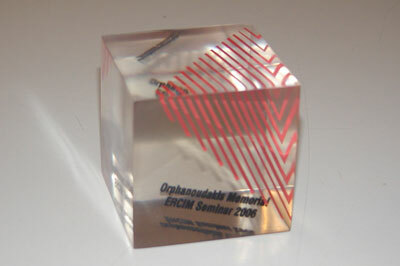 In honour of Stelios Orphanoudakis, the fourth president of ERCIM, a memorial seminar was held on 30 May 2006 in Budapest during the ERCIM meetings at SZTAKI. The premature passing of Stelios Orphanoudakis on 18 March 2005 was a great loss for the ERCIM community. A commemorative event was organized by Constantine Stephanidis, director of FORTH-ICS, and was held in Budapest during the ERCIM meetings. The memorial seminar was opened by Keith Jeffery, president of ERCIM, whose speech highlighted the accomplishments of Stelios Orphanoudakis and the outstanding role he played in ERCIM. On behalf of the ERCIM community, Keith Jeffery thanked the organizers of the meeting for their efforts, and Jose Koster (CWI) from the Human Resources Managers Task Group of ERCIM, for commissioning a sculpture for permanent exhibition at FORTH-ICS, as a symbol of ERCIM community’s high esteem for Stelios Orphanoudakis. He also thanked Cor Baayen, Dennis Tzichritzis and Gerard van Oortmerssen, former presidents of ERCIM, Alain Bensoussan, one of the 'founding fathers' of ERCIM, and the Orphanoudakis family members for their participation in the event. 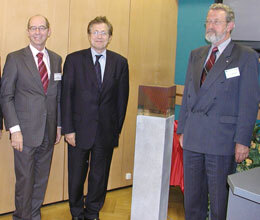 From left: The former ERCIM presidents Gerard van Oortmerssen, Dennis Tsichritzis and Cor Baayen. 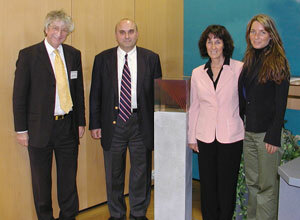 From left: Keith Jeffery, ERCIM president, Constantine Stephanidis director of ICS-FORTH, Ava and Eleni Orphanoudakis, wife and daughter of Stelios Orphanoudakis. The director of ICS-FORTH, Constantine Stephanidis, then gave an overview of the oeuvre of Stelios Orphanoudakis, briefly outlining his distinguished academic career and outstanding scientific achievements, his fundamental role in the life of FORTH and in the past and the future of ICT in Greece, and his influential pioneering activities in international scientific cooperation. Stelios Orphanoudakis deeply believed in ERCIM’s promotion of European scientific research, and was actively committed to the achievement of this objective. His absence is a great loss for FORTH, for Greece, and for the international scientific community. As a former colleague, Constantine Stephanidis also warmly recalled their collaboration and friendship. Technical presentations by distinguished speakers and former collaborators of Stelios Orphanoudakis followed, reflecting his main fields of research. Stelios Orphanoudakis had dedicated many years of teaching and research to the fields of computational vision and robotics, intelligent image management and retrieval by content, medical informatics, and medical imaging. The first talk was entitled ‘Stelios Orphanoudakis, The European and The Greek’, and was given by Niels Rossing (Danish Centre for Health Telematics, Denmark). The talk addressed past and future developments in e-Health, with reference to the pioneering ideas of Stelios Orphanoudakis in this area. Special mention was given to HYGEIAnet, the Integrated Regional Health Information Network of Crete, which is one of Orphanoudakis’ most significant achievements. The second talk, 'Computer Vision and Intelligent Systems', was presented by Jan-Olof Eklundh (KTH, Sweden), who summarized the trends in computational vision and robotics. Kostas Daniilidis (University of Pennsylvania, USA) gave the third presentation, '3D Visuali-zation, 3D Navigation, 3D Content Creation'. The pioneering work of Stelios Orphanoudakis in all these areas was emphasized. In addition to his research activities, Orphanoudakis had served on various committees and Working Groups of the European Commission, and was active in numerous European R&D programs. After the break, Ilias Iakovidis (Deputy Head of Unit-ICT for Health, European Commission) gave a talk entitled 'e-Health: Achievements and Future Plans of the European Union'. Iakovidis also highlighted the important role played by Stelios Orphanoudakis in this area and in the European cooperation. All the presentations offered a unique blend of science and personal reflections. In the second part of the meeting, Cor Baayen, Dennis Tscihritzis, Gerard van Oortmerssen and Alain Bensoussan discussed the extraordinary merits of Stelios Orphanoudakis as a scientist and as an individual, expressing their high estimation of his role in promoting ERCIM. They described Stelios with great warmth, giving tribute to his charismatic personality, and his vision as a scientist who realized his ideas and plans with vigour. He had been a strong and pragmatic advocate of cooperation in Europe, and a great supporter of ERCIM since its inception. A replica of the memorial artwork for permanent exhibition at ICS-FORTH as a sign of the high esteem in which the ERCIM community holds its former president Stelios Orphanoudakis. At the end of the meeting, the commemorative sculpture was presented to Constantine Stephanidis for permanent exhibition at FORTH-ICS, and small replicas were presented to Ava Orphanoudakis and the invited speakers. The seminar concluded with a heartfelt speech by Ava Orphanoudakis, which was greatly appreciated by the audience.